These slate serving boards make it easy to serve up a side of pride with your favorite cheeses. 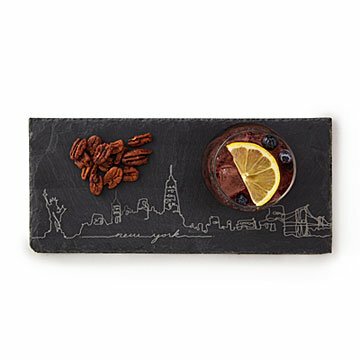 Pay tribute to the place you love most with a serving board that toasts its unique skyline. Decorated with hand-drawn views of New York, Boston, and five other cities, these elegant slabs of slate make it easy to serve up a side of hometown pride with your favorite cheese-and-fruit combos. And here's an insider gifting tip: They make great tokens for friends who've newly moved—or for old pals who can't get enough of their city. Handmade in Vermont. Wash in warm soapy water immediately after each use and dry thoroughly. Do not use as a cutting board because it will dull your knife. Lifetime Guarantee, no questions asked. I have Chicago in Lego and stuffed Chicago ornament (not just for the holidays). This was a gift for family in Denmark. Thoughtful and more personal gift! Needed to find a thoughtful gift for a friend hosting me in their new home. Great as they also love to host!